Imagine a fabulous ten day tour through Portugal and Spain, visiting World Heritage sites along the way and staying in outstanding accommodation. Visit the charismatic capital cities of Lisbon and Madrid, and explore the historical towns of Queluz, Evora, Caceres, Alcala de Henares and Palmela, each with its own Pousada or Parador. Of course this tour can also be done by starting at Madrid visiting Lisbon and returning home from Madrid, but I shall begin in Lisbon. The Pousadas of Portugal and the Paradors of Spain are luxury hotels, many of which are located in World Heritage Sites because of their exceptional cultural value and beauty. A ten day tour would allow you to take advantage of the five night discount, enabling you to explore more than one destination in style. Only 5 km from Lisbon is the town of Quelez, which dates back to 4200 BC. By spending your first night in the Pousada de Queluz you are still within easy reach of Lisbon, yet able to enjoy the tranquil setting of this fascinating town. 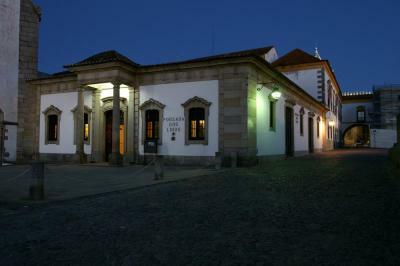 The Pousada is located in the square in front of the Queluz National Palace, once the summer residence of the Royal family during the 18th century. The Corzinha restaurant within is in the original Palace kitchen with timbered ceiling and stone fireplace. Exploring Lisbon could not be easier as it is relatively small and therefore easy to find your way around. The best way to get about is on the electric trams, which run through its narrow streets giving you a wonderful overview of what there is to see. The main sites to visit are the Monument of Discoveries attracting millions of visitors each year, and the Parque das Nacoes, the site for Expo 98. Now a leisure park, there are water gardens and an Oceanarium considered to be one of the world’s most impressive aquariums. 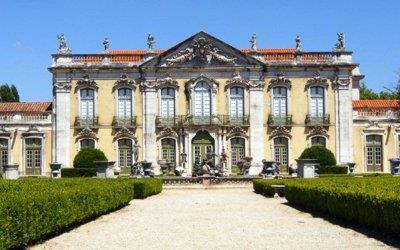 However, Lisbon is most famous for its iconic cafes, amazing nightlife, and art nouveau shops. By heading east you will come to the fortified town of Evora, which is a World Heritage site. The Pousada Evora, originally a 15th century Convent, is right in the centre and beautifully restored, with painted walls and ceilings in one of the lounges. Evora attracted so many Architects from all over the world. it was left with a very rich architectural heritage. There is the well preserved Roman temple of Diana which dates back to the 2nd century, and the 16th century chapel, Capela dos Ossos where the bones of no less than 5,000 monks are embedded in the walls. To learn more about its history you can join one of the many cultural tours. Although it is quite easy to walk to the main sites, one of the nicest ways to get about is by horse and carriage. Crossing the border into Spain the next stop is the World Heritage Site of Caceres staying at Parador Caceres, the 14th century Palace of Torreorez. The views from the Parador are particularly attractive at night when the defensive walls of the town and buildings are lit up. May is a particularly good time to visit, as the Womad Festival of World Music is held in Caceres. Just 26 km from Madrid is Alcala de Henares, yet another World Heritage site. 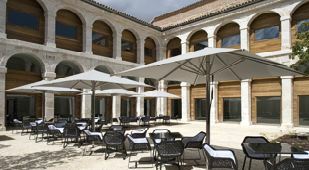 By basing yourself at the Parador Alcala de Henares (Convento de Santo Tomas) for three nights, it will give you a chance to explore the big city during the day and come back to the charm of this beautiful town in the evenings. There are a few key things not be missed when visiting Madrid. Grab the chance to watch some of Spain’s finest Matadors in the bullfighting ring of La Plaza de Toros de Las Ventas del Espiritu Santo. Dine in the oldest restaurant in the world, the Botin, which opened in 1725. The Corral de la Moreria restaurant is the place to go if you want to see the best flamenco dancers. Most visitors love the cable car ride, giving them a panoramic view of all the sites such as the Royal Palace and Armoury. Las Salesas District is one of the most exclusive parts of town, both very chic and trendy, with unique shops and art galleries. Heading back in the direction of Lisbon, break up the journey with a night at the Parador of Gredos. 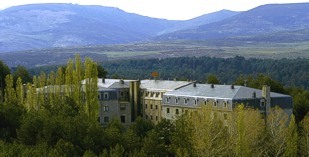 It was built in 1928 because King Alfonso XIII wanted to establish a royal hunt in the area, and has spectacular views of the Piedrahita and Bejar Mountains, and the Tormes Valley. The area is perfect for walking, fishing, and climbing which are only a few of the different activities available in the area. You may be interested to know the Parador was where the final draft of the new Spanish Constitution was finalised, and has a signed copy on display. The final destination is Palmela along the western coast of Portugal just south of Lisbon. Part of a medieval castle, the Pousada Palmela (Hotel Castelo de Palmela) was built by the Moors on a hilltop. The panoramic views are breathtaking, the seafood is excellent, and you can also sample the regional muscatel wine. Not far from Palmela is the Arrabida National Park which is a haven for wildlife and the port of Setabul, where you can take a boat trip on the Sado Estuary to go dolphin watching - a fabulous memory to take home with you.